We will not be getting the new Seraphims in this year. I will add photos here soon so you know what is being added to the collection. Click here to view an interesting new project and site. 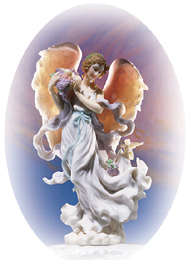 The new news we have about angels is about our angel bowl band. The angel bowl band plays in the Rome Ga/ Chattanooga Tn area and consist of 8 crystal bowls. Sometimes the band consist of 8 people and at other times, I play all 8 bowls by myself. If you have never heard of crystal bowls, they are beautiful and very moving. 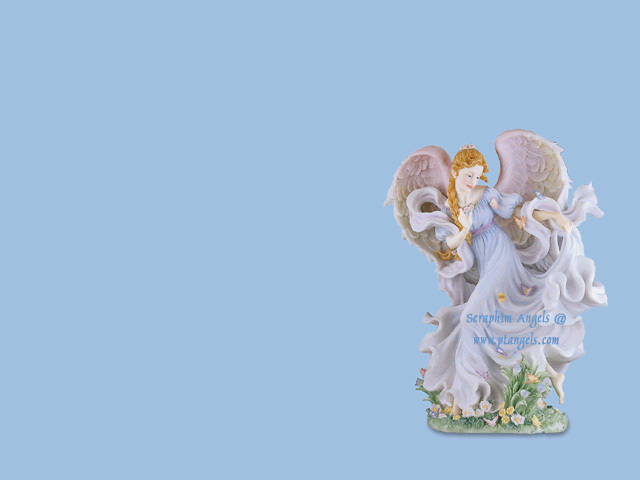 We will post any news about the Seraphim Collection on this page with links to photos. The latest news will be at the top and you can scroll down to review the history. Would you like to have Jacquelyn for your desk top? AOL users - be sure to deselect use compressed graphics in your AOL preferences or the photo will be distorted. Click on the photo to the left and right click your mouse. Select "set as wall paper".